King's Cross and St. Pancras train stations sit across the street from each other and serve as the major hub for rail travel throughout England and beyond. The two stations share a common underground terminal making it convenient for travelers to move between rail lines. King's Cross rail service goes to York, Newcastle, and onto Scotland. The more famous St. Pancras station is home to the Eurostar trains that go under the English Channel (lovingly known as the 'Chunnel') into Europe, most notably to Paris. For many people the experience of visiting the two stations is akin to visiting a major airport terminal. This includes clearing customs if you are travelling back from Europe on the Eurostar. The terminal also is a hub for the London Underground subway system and Capital train system allowing for convenient transport to and from all major airports. The area is much more than just a center for transportation; it is a destination in and of itself. 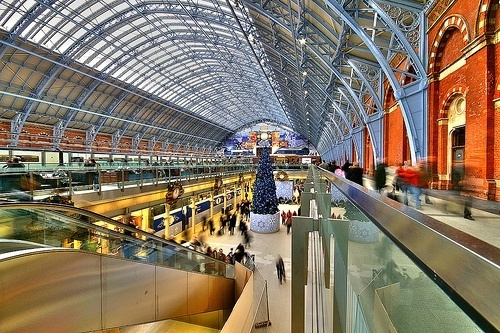 The St Pancras station hosts a major shopping and dining complex. Visitors can take advantage of the 23 shops offering everything from clothing to jewelry. There is even a pharmacy should you need one. The dining and drinking scene is one of the best in London. There are five full service restaurants offering both traditional English fair and exotic food choices such as sushi. If you're in a rush to catch one of the many trains the terminal also has 11 grab and go vendors. A must do while you are at St. Pancras is to stop by Champagne bar, said to be the longest one in all of Europe, it stretches more than 100 yards long. Need to get some sleep before your trip? There are a number of fine hotels on the streets above the stations. Last updated by Jodi J on 18 May, 2010 in Destinations. No argument there! King's Cross is a pit, but not much choice for a lot of journeys into and out of London. Don't use Kings Cross unless you have to. St Pancras is spectacular, if a little too airport. KX was always pokey and is now in throws of renovation. It is a building site some years from completion.